This Alps Outdoorz Commander review is about a tool with a freighter frame plus a pack bag. 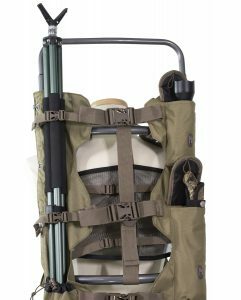 This is an extraordinary versatile load hauling tool with an external frame, suitable for any outdoor activity which involves a lot of stuff and weight in the pack, like camping, hunting, backpacking, and hiking. Product: ALPS OutdoorZ Commander Freighter Frame + Pack Bag. Several tools in one: removable back pack + freighter frame + extras. It comes with a rifle holder. Extra lashing system to use without the pack. So here is the link for the frame alone. Here is the link for the bag only. Alps Outdoorz Commander freighter with the bag. It is important to stress that with this tool you have two things: the Commander Freighter Frame, plus an 86 liters (5250 cubic inches) pack. With its 3.32 kg, this is a heavy tool and the most of its weight is in the frame. So if you count ounces this is not what you would use. 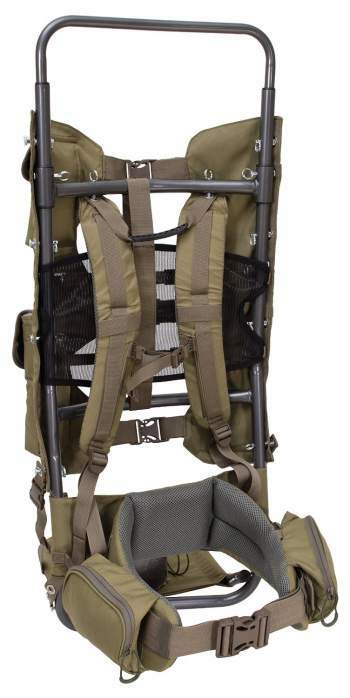 But if you are out there for camping or hunting, or for any other activity, and you really have a lot of stuff to carry, then this Alps OutdoorZ Commander freighter frame with bag is a tool for you. You will be able to carry practically everything you might need. One of the things that stand out is its very affordable price. There is nothing that would even remotely be a match to this set. The pack is a top-loading type, with the lid which attaches to the front with two buckles. You can see it in the picture. Underneath the lid, you have a hold-open system which implies a bar that runs around the perimeter of the collar. With this, you have a very wide opening and an easy access to the stuff in the main compartment. Note that the spindrift collar is expandable, and it can give you around 8-10 liters of extra volume if you need it. The pack includes also the zippered bottom compartment, so indeed this is a feature you would expect from a nicely designed hiking or backpacking pack. An interesting feature is yet another collar with a draw cord, which is there as soon as you open the external zipper. But I must say I do not see the purpose of it at all, the zipper alone would do the job as usual. On the other hand, there is a divider between the two compartments, which has the same structure, so you have a collar with yet another draw cord. The pack is hydration compatible, there is a water sleeve in the main compartment where you can put any 3 – 5 litters bladder, and there is a hanger for the water bladder above it. The pipe ports are on both sides, above your shoulders. 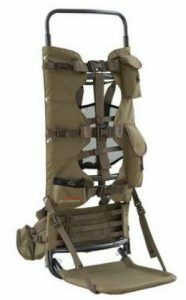 The pack alone with its attachment points and pockets. As you can imagine, the whole frame is a structure where you can attach things from various sides, practically anywhere around. This is one of the main differences between an external frame pack and the packs with internal frames. In fact, this is the advantage of such packs in general. But there are many attachment elements on the pack itself. This is where this tool really shines. • So, on the lid, you have 4 webbing loops to attach things like a sleeping pad or practically anything. • On the front you have a daisy chain running vertically on the front pocket, to attach any small item. 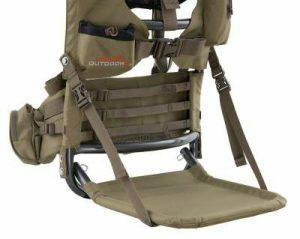 • Completely on the bottom, you have dual compression straps to attach a tent or anything similar. • On the right side, you have a small pocket which contains the holder for your rifle. So you will use it only when you need it, otherwise, you tuck it away into the pocket. 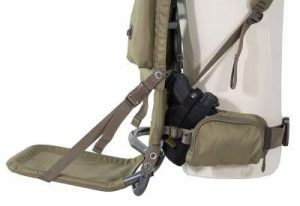 The rifle is kept by the holder and it is fixed into position in a clever way: it runs vertically behind the two side pockets that are fixed onto the bag through 4 buckles (2 for each of the pockets). This is a very clever and useful design, everything is adjustable here. You can see it in the pictures. • There are straps running along the shoulder straps, so you can attach things here as well. They are visible in the picture below. • On the hip belt, you have attachment webbing elements to fix a pistol holder, it is shown in one of the pictures. The lid is with a zipper in the middle, which allows you to enter a huge pocket which is of the size of the lid. On the front, you have a relatively small zippered pocket for smaller items, while on the right side you have the two zippered pockets mentioned above. On the left side there is one very deep pocket with a long zipper, so it opens half way around the pocket. You can store a complete tent here. There are two zippered pockets on the hip belt, quite sizeable indeed and very useful, see them below. Note, this is not all, see the section about the frame below. The adjustable harness system attached to the frame. For a pack with such a load-hauling capability, the suspension is of great importance. The harness is such that it fits torso lengths in the range 17 – 23 inches (43 – 58 cm). Note, it is adjustable in the sense that the frame bar can be moved up or down, see a bit more below. The shoulder straps are well padded and the same is with the hip belt. There is the usual sternum strap with a rail system for vertical adjustment. The waist belt is good for anybody within the range 26 – 40 inches (66 – 102 cm), but there is a larger option available as well. The frame shown in the picture above is a lightweight aluminum structure, power coated and with a very nice finish. The numerous pins are from steel. Naturally, the frame is the heaviest part of the tool as you may realize from the specifications below. The frame is adjustable to accommodate your body size. The adjustment is achieved by moving up and down the horizontal bar to which the harness is attached. You will see this in the video below. The frame has several horizontal bars, it is sturdy and reliable. You can use the frame without the bag of course. So this is a unit for itself because the harness is attached directly to it. In the central portion of the frame, you have a mesh which is supposed to separate your back from the pack and to allow for ventilation. You will need a lot of it (I mean ventilation) with such a huge pack. Side lashing system with a lot of useful features in itself. You will use this when you remove the back, so only with the frame. A top bar which connects the two main vertical side bars. So when you have the bag removed, you put the lashing system and the shelf. Now you can carry practically anything here, an ordinary bag, your meat, or just anything. The load is kept by the bottom shelf, and fixed into position with several long horizontal compression straps on the front. The straps are equipped with buckles. Oh yes, you have an extra strap in the pocket, to use if you need it. Remember there is a frame around and you can attach any extra strap anywhere. On the lashing element, you have two nicely designed pockets on the right side. They describe them as flashlight pocket (the upper) and the knife pocket (the lower). On the other side you have what they call a spotting scope pocket system: a pouch plus an extra compression strap, so you can fix elongated objects there. The shelf itself is huge and foldable. You can see it in the pictures below and there is more in the video. The top bar can slide up or down so that you change the capacity of the frame itself. The lashing system in place. The pockets in the lashing system. Details of the foldable shelf. Now, this title may sound really stupid, but this tool is so complex that it is necessary to say a few words. Namely, it comes assembled with the lashing system. So you will need to remove this part first in order to use the tool as a freighter-plus -pack tool. It would be pointless to keep the lashing system on, you cannot use it that way and it just adds the weight. In the video below you will see how to do this. Of course, as a start, you can also remove the pack and keep the lashing system if this will be your first use of the tool. The other extra elements (the top bar and the shelf) can stay there of course. You can definitely use them together with the pack or with the lashing system. This extra bar adds a lot of attachment options, and the shelf itself can be used to attach literally anything on it, both with the pack and with the frame alone. The pack cannot be used separately as a pack alone. Some users claim they were carrying up to 150 lb (68 kg) with this tool, which sounds simply incredible. The pack itself is very lightweight, as you will see below it is only 1 kg. 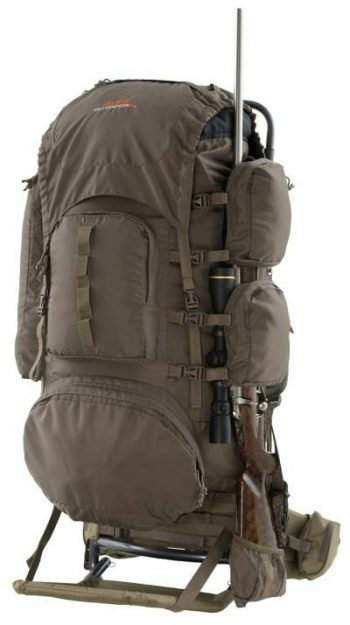 But observe that the pack cannot be used separately as an ordinary backpack. The pack has no rain cover, though it is water resistant, in particular the top lid. This tool has received great reviews by Amazon customers. Its average rating on Amazon is 4.4/5. In the moment of writing the text, it is top ranking and best selling item on Amazon in the group of external frame packs. Total weight: 7 lb 5 oz (3.32 kg). Pack weight: 2 lb 3 oz (1 kg). Volume: 5250 cu in (86 liters). Torso fit range: 17 – 23 in (43 – 58 cm). – Standard: 26 – 40 in (66 – 102 cm). – X-Large: 40+ inches (102+ cm). 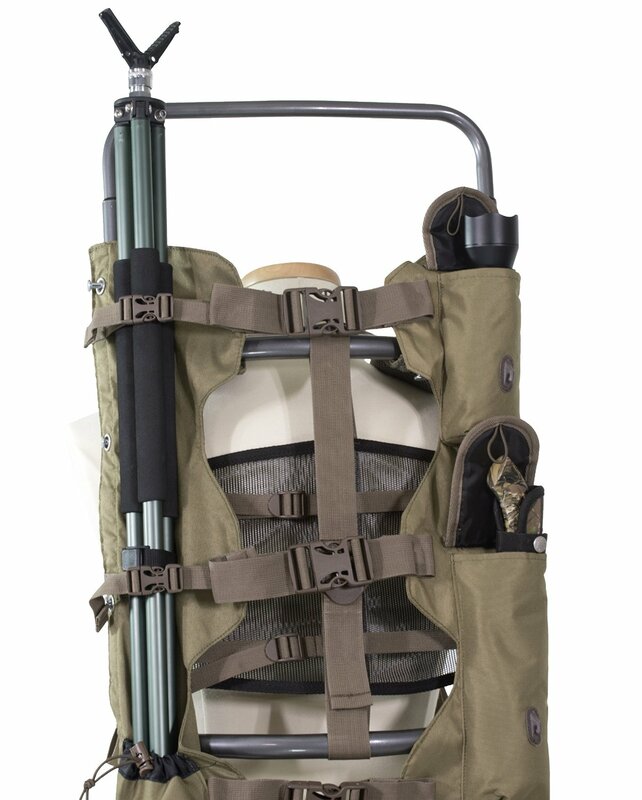 Frame and lashing straps included with pack bag. 2 side accessory hinged pockets. Lashing system with several pockets. So to conclude this Alps Outdoorz Commander review by saying that this is probably the most versatile tool of this type presented in this site. With so many great features and carry options, and with such a price tag, this tool is a real bargain. This pack is not necessarily a backpacking tool but it can be used for this purpose as well. You will be able to carry whatever you need, the gun holder can easily accommodate any tripod or anything similar. Note, if you feel this external frame pack is not for you, or you want even a bigger one, please see this Kelty Tioga External Frame pack. Need an external frame pack for your teenager? 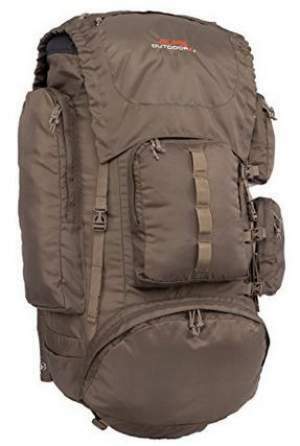 See this Kelty Yukon 48 pack. So, was this text useful to you? If so please share it with others. If you have any question or comment please use the comment box below. Thank you. Have a back frame for hauling animals only. All webbing has deteriorated and am needed replacement parts. Frame and attachment points are similar to one shown here. Possible to buy without frame? Hi Tom, I would suggest you to contact the manufacturer. This is a well-known brand, they are together with Alps Mountaineering and Browning Camping brands, and I know they have a very good customers service and a good reputation in general. Alps have stated in the next few months they will be selling these packs via Amazon UK themselves and not through a third party, it will be interesting to see what price it is pitched at. Their European Supplier is out of stock of this item at present. Amazon.com do not ship the item to the UK. Frustrating (is a very polite word!) as most items are well over priced in the UK compared to the US and often mainland Europe. Enjoying reading through your site, thanks. Thank you for the updates Trev. Yes, this is a polite word, in view of such a huge difference in prices in the two stores. You should see these Slovakian “sherpas” over 60 years old guys carrying on their backs over 120 kg (265 lb) (in very heavy and primitive homemade wooden frames and taking these loads for hours high into the mountain lodges of “High Tatras” . I would not believe that is possible, but I have personally seen them myself there. I simply could not move their load even one step ahead. This was awesome to see. I can even understand a bit the language, it is close to my native. You have seen things Peter. Thank you. I have seen this film in complete as I’m Czech-German and Czech and Slovakian languages are for me like two very close dialects. I tried to listen to Serbian TV News few times and picked up maybe 50-60% but generally got the point of the message. Awesome film, even if the language is not exactly your own you will understand, besides it is masterpiece visually and High Tatras are small but very photogenic mountains. You will be stunned by the type of backpacks these guys use – simply unbelievable and against all current recommendation these guys are holding most of the load on their shoulders, rather than hips! BTW to your review, is it possible to buy this “Alps OutdoorZ Commander” in Europe for prices comparable to those in US? Thank you Peter, I shall surely find this film. I checked for the Alps OutdoorZ Commander and see it in DE Amazon store for 380. The same is on FR store, at UK it is far more expensive. So very expensive as you realize. I have not been to Tatras yet, you seem to have seen a lot in your life, it would be great to have some text from you. We all need first-hand information when we go to mountains, I read what others have experienced. This is why I have an open invitation for Guest Authors, you can see it here. A few people have been kind enough to send me a few texts. I found the lowest prices in EU on ebay.de https://goo.gl/wcCZBk (similar to US prices) but you have to add the European VAT and customs duty. Actually what do you think is currently best (especially ergonomically) external frame backpack of approx. 50-70 liters available anywhere in Europe and suitable for extended hiking trips of at least 3-6 months. I checked the link, those are good numbers indeed. Long ago I started mountaineering with an external frame packs but later switched to new design and have not been following very closely those classical packs. 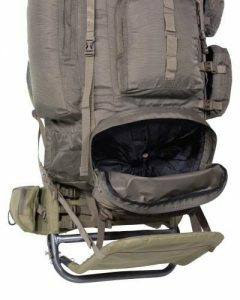 Perhaps you have seen Kelty Tioga, but this is bigger than you want, they have Trekker as well in the size you want. Both have received very good reviews. 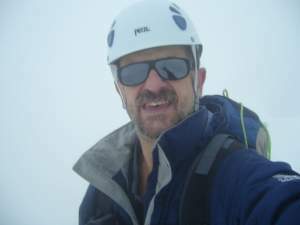 I know also that ALPS Mountaineering has several models but cannot say more at this moment. Would love one of these but at at over £300 on Amazon Uk it is ridiculous considering the actual price in the USA, someone is really taking the p*** out of the English!! Yes I can understand your frustration. Just searched in the UK store and it is really 3 times more expensive than on the US store. Is there a way that you order it directly from the US Amazon?